Do you remember Diskwars? If you’re like me, I’m sure it doesn’t bring back great memories. Fantasy Flight Games has decided to ressurect the disk play mechanic with the release of Warhammer: Diskwars which will retail for $39.95. The new game is “a fast-paced, tactical battle game for 2-4 players that can be played in an hour or less.” The new game is based on that “classic” which was designed by Christian T. Petersen and Tom Jolly with an updated setting of Games Workshop‘s Warhammer world. There is a slight difference though. 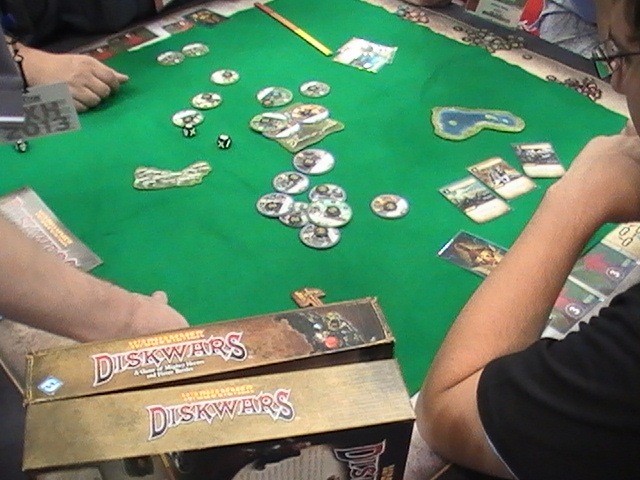 The original Diskwars was a collectible disk game focused on armies and not much personality. 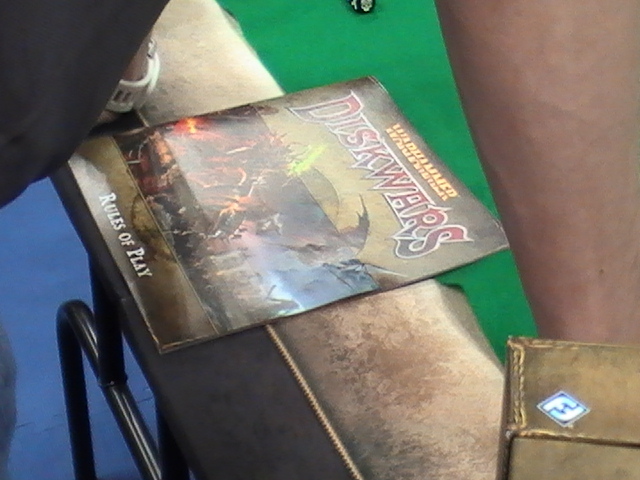 The new Warhammer: Diskwars has been updated and features flexible rules for more of a “hero-centric army building.” The collectible aspect has been shelved as well for the initial release with everything you need to play for two players in the initial set. The game debuted this past weekend at Gen Con 2013 with demos being run at the Fantasy Flight booth. The game features disks which represent individuals or large units and each disk has statistics and some have special abilities. To move you flip the disk over and over on its end affected by terrain and other disks. When you land on another disk you stop and “pin” the desk beneath. The one beneath can’t move and the two then have to fight each other. Having played the original game, the mechanic was fun a few plays in but quickly wore out it’s welcome. The game was somewhat popular with sales plummeting months after the release (at least at the shop I worked in at the time). Since this new game will be set in the Warhammer world, you can expect characters, creatures and armies from that set including Orcs, Chaos, High Elves and the Empire. The initial set will include twenty-four command cards, five terrain cards, five scenario cards and more than sixty disks. For those that kept theirs, now’s a chance to dust off the old discs collecting dust.